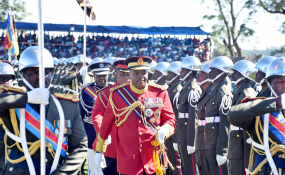 There were many local media reports of chaos and confusion as Swaziland / Eswatini voters turned out to nominate candidates in the forthcoming House of Assembly election. Nominations took place at chiefdoms across the kingdom on 28 and 29 July 2018. During the time-consuming process the name of the nominee was raised by a show of hands and the nominee given an opportunity to indicate whether he or she accepted the nomination. There were delays in different parts of the Shiselweni region. Some people decided not to wait and left before the process was finished. The Swazi Observer reported (30 July 2018) said there were many complaints. It said, 'Some of these complaints included the decision by the overseers of the process to close the nomination when voters still wanted to raise names of the people they were interested to nominate. It added, 'In some areas, other residents claimed that the officials were seemingly biased and also others looking like they were having interests, especially on whose side they were in and who they wanted to see eventually winning. Elsewhere, there was confusion at the Ngwane Park High School polling station as many voters and aspiring candidates were turned back on Saturday and told to return next day. The Sunday Observer reported (29 July 2018) people started arriving at the station as early as 8 a.m. Some people complained they would not be able to go to nominations on the Sunday because they would be at church. Dozens of voters from Mbadlane under Dvokodvweni Constituency were 'stunned' to learn that they had been registered to nominate at Entandweni chiefdom as opposed to their home chiefdom, Malindza, the Sunday Observer reported (29 July 2018). The EBC blamed a computer error and rectified the mistake. The Times Sunday (29 July 2018) reported a 'verbal showdown' between human rights activist and newspaper columnist Musa Hlophe and EBC officials at KaLanga. He accused them of bias and complained he had not been called to make a nomination when he raised his hand. He also said that women and people with disabilities were being ignored and not allowed to nominate candidates. Ahead of the nominations it was reported nearly 500 names were removed from the voters' roll at Ngudzeni when it was discovered they were people who did not live in the area. The Observer on Saturday reported (21 July 2018) that non-residents had been brought in by aspiring candidates from as far afield as Luhlokohla in Hhelehhele and kaPhunga near Lavundlamanti. It added usually there were about 900 voters but this number had been inflated by 498 strangers. In Swaziland political parties are banned from taking part in the national election and people are required to nominate individuals to represent them in the House of Assembly. King Mswati III rules the kingdom as one of the world's last absolute monarchs. He chooses the Prime Minister and government. No members of the Swazi Senate are elected by the people.